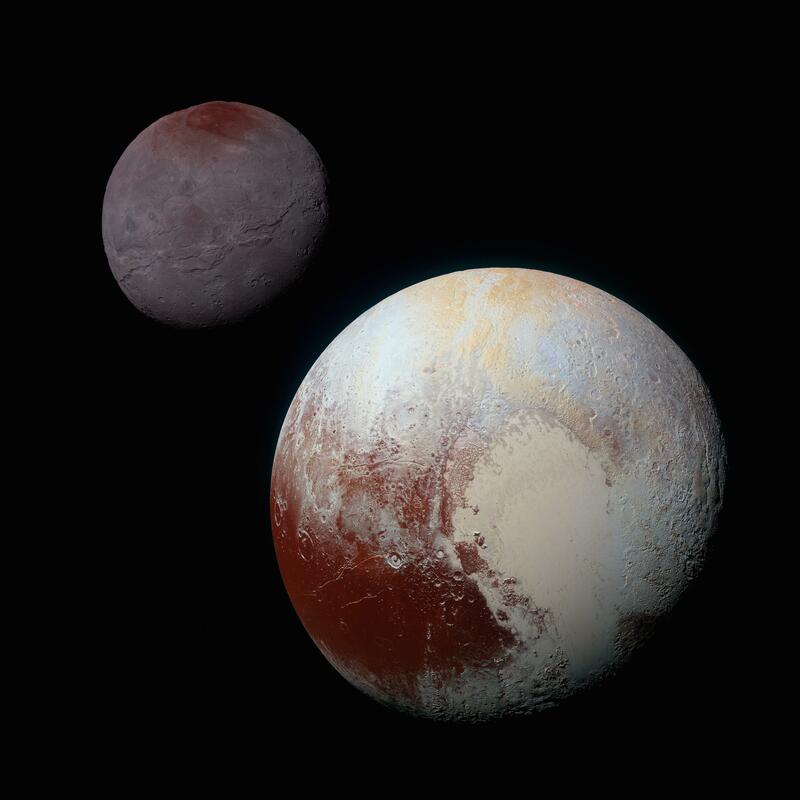 Pluto and its largest moon, Charon, identically enhanced and processed. In 2006, the International Astronomical Union (IAU) passed two resolutions that resonated strongly with the public and had an immediate impact on elementary school curricula. The first was a change in the definition of what it means for an object in our Solar System to be a “planet”. The second introduced and defined the term “dwarf planets”. 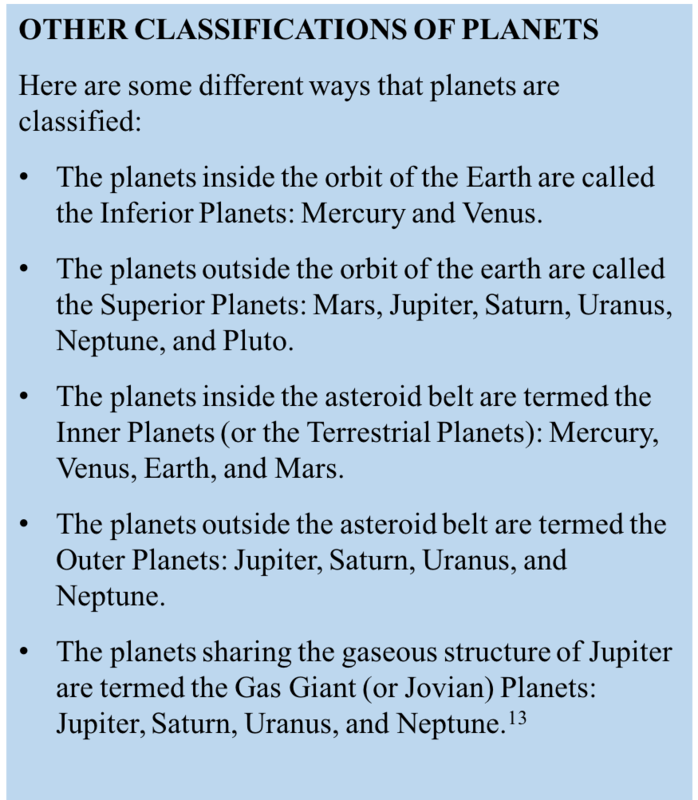 The notorious revision of these definitions stripped Pluto of its planetary status and took the world by storm. It is important to understand why the definition of a planet had to be changed and why Pluto, despite being reclassified, is still essential to our understanding of our solar system. The discovery of the Kuiper Belt and an increase in our understanding of the objects within the Kuiper Belt led to the re-evaluation of planetary classification. 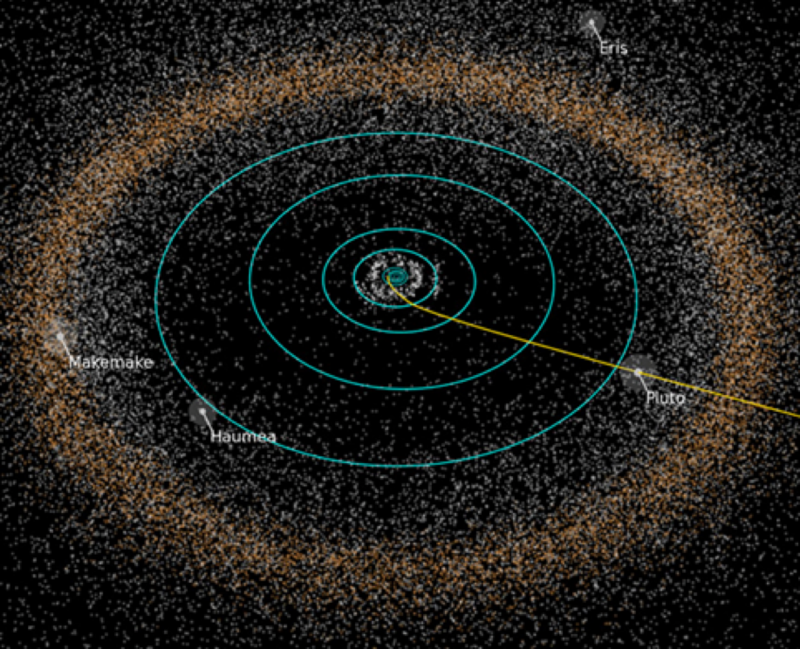 The Kuiper Belt is a zone at the edge of our solar system stretching over 20 astronomical units (AU)—that is, 20 times the distance from the Earth to the Sun—which contains thousands of astronomical objects composed mostly of ice and ranging vastly in size. Pluto is the largest known dwarf planet and is the second closest dwarf planet to the Sun.1 It is suspected that hundreds of dwarf planets exist within the Kuiper Belt. Though Pluto is no longer technically classified as a planet, it is essential to continue to study Pluto and keep it in school curricula. Pluto and the Kuiper Belt hold valuable information about the creation of our solar system, including how planetary orbits and locations vary with time. The massive size of the Kuiper Belt itself, along with its recent discovery, demonstrates how little is known about our solar system—how much there still is to explore. By studying the history of Pluto and the Kuiper Belt, society can achieve a greater understanding of our solar system, its creation, and how the objects within it are classified. They may also learn to appreciate the importance of Pluto and the Kuiper Belt and why these astronomical topics should remain in the school curricula at all ages. To incorporate these topics into your classroom, please check out some of our useful tools for teachers! In the outer regions of the star’s disk, the gas and dust is less dense. In our solar system, this area is known as the Kuiper Belt. This region is less affected by solar winds, which blow away lighter particles in developing regions nearer to the star. These lighter particles circulate in the outer-disk to create objects like asteroids, comets, dwarf planets, and moons. Due to the length of its orbital path, and its small orbital speed, Pluto along with the other Kuiper Belt objects never managed to coalesce into a large planet. Pluto is extremely cold and covered with ice. Its temperature ranges from about 33 to 55 Kelvin. Pluto’s mass is just 0.2% that of the Earth and 18% that of the moon”.3 Its gravity is about one-fifteenth the Earth’s gravity and its diameter is about 2,300 km. Pluto has five moons: Charon, Kerberos, Nix, Hydra, and Styx. Pluto orbits the Sun at a distance of about 5.8 billion kilometers on average and its orbital period is 248 years. Its orbit is found in the Kuiper Belt and it is notable that Pluto’s mass is less than 1% of the total mass of all the objects found in its orbit.4 Pluto’s orbit is inclined relative to the orbits of the planets in our solar system and is also more oval-like. “Pluto Through Time”. Copyright 2016 Christopher Altrogge. 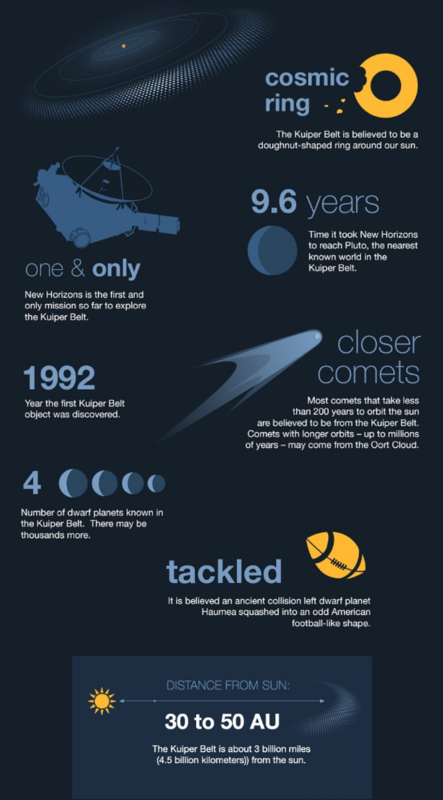 Facts on the Kuiper Belt. Courtesy of NASA/JPL-Caltech/Bill Dunford and Katie McKissick. The Kuiper Belt marked its debut with the discovery of Pluto in 1930 and has since sparked the interest of astronomers, however the Kuiper Belt had otherwise evaded the eyes of astronomers for centuries. New information and discoveries are found regularly within the Kuiper Belt, yet there is still much to learn about this recently discovered realm. The Kuiper Belt itself is a disc-shaped region of icy bodies, dwarf planets, and comets located beyond Neptune’s orbit. It extends from about 30 – 55 AU and is populated with hundreds of thousands of icy bodies larger than 100 km across plus an estimated trillion comets. Astronomers can find Kuiper Belt Objects (KBO) among the myriad of faint stars because KBOs move slowly over time. To observe these slight shifts in position, very detailed photographs of the sky are taken in given time intervals to reveal the motion of these little ‘stars’. A very small change in position indicates that the object is very far from the Sun and most likely located in the Kuiper Belt. Large changes indicate objects closer to the sun and are more easily discovered. 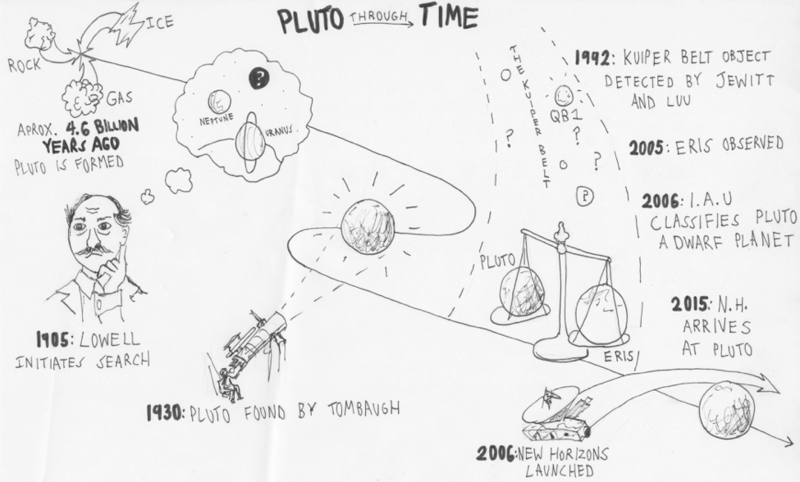 1930: Clyde Tombaugh discovers Pluto, which later turns out to be one of many KBOs. 1943: Astronomer Kenneth E. Edgeworth speculated that there could exist smaller planets beyond Pluto’s orbit. 1951: Gerard Kuiper expanded on this theory through a mass-distribution model that predicted the existence of large icy masses formed during the creation of our solar system. However, Kuiper believed that the gravitational forces of Pluto had since relocated these masses. At the time, Pluto was believed to be much larger, so naturally, he predicted that it would have cleared the entire surrounding area of debris. 1992: David Jewitt and Jane Luu discovered what was believed to be the first Kuiper Belt object: an icy mass about 250 km in diameter that was attributed the name “1992 QB1”. 2002: Quaoar, a large Kuiper Belt object, about five times the diameter of 1992 QB1, was discovered. Ironically, Quaoar had been photographed as early as 1980, but was not recognized as a Kuiper Belt Object until 2002. 2004: Haumea, an egg-shaped dwarf planet, was discovered in the Kuiper Belt located just beyond Neptune’s orbit. It is thought to have collided with an object about half its size, which would account for the fast spin and unique shape. 2005: The dwarf planet Eris was discovered. It is the second largest known dwarf planet at about 2300 km in diameter, and is still considered the most massive Dwarf Planet. The discovery of an object in the Kuiper Belt more massive than Pluto sparked the debate on Pluto’s planetary status and the definition of a planet. 2005: The Kuiper Belt Object Makemake, also known as 2005FY9, was discovered. Makemake was later classified as a dwarf planet. This was made official by the International Astronomical Union in 2008. 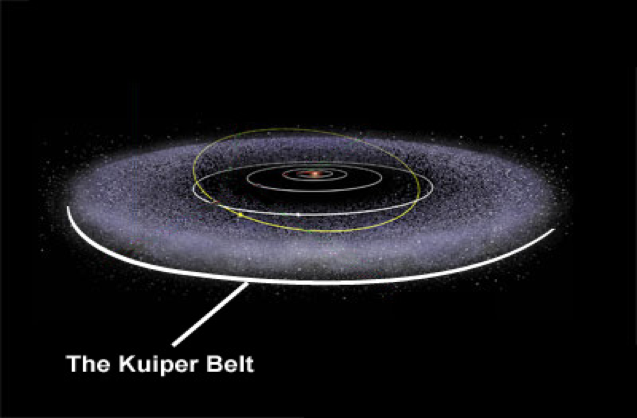 The Kuiper Belt. Courtesy of NASA/JHUAPL/SwRI. Millions of objects are estimated to lie within the Kuiper Belt, and with new objects continuously being discovered, it is important to categorize and monitor the different kinds of objects in the Belt. Different types of Kuiper Belt Objects exist due to the different ways KBOs have gravitationally interacted with Neptune. Kuiper Belt Objects are divided into five major categories: Cold Classical KBO’s, Hot Classical KBO’s, Resonant KBO’s, Scattered KBO’s and a newly created, unnamed group composed of only two unique objects. ‘Cold’ Classical KBOs do not refer to temperature at all. Though these KBOs are located between 42 and 48 AU from the Sun, their temperature is not significantly different from other KBO since everything is cold by Earth standards at such a great distance. ‘Cold’ simply refers to objects that have consistent and unperturbed orbits. Cold Classical KBOs occupy a narrow region about 6 AU wide and about 7 AU thick, and they tend to be smaller and redder than other KBOs. Hot Classical KBOs refer to objects with orbits that are inconsistent, irregular, or eccentric. Again, the term ‘hot’ in its name does not refer to temperature, as their eccentric orbits cause them to stray much farther from the Sun than many Cold Classical KBOs. Their sizes and colors vary, but Hot Classical KBOs tend to appear much larger and grayer than Cold Classical KBOs. Resonant KBOs orbit in resonance with Neptune, either due to the influence of Neptune or simply by chance. This explains why these objects have not been cleared away by Neptune’s gravitational force. Resonant KBOs are divided into many subsections that define the interval of resonance a particular object has. Plutinos, for example, have a 2:3 resonance and make up the largest subsection of Resonant KBOs with 92 confirmed plutino objects. Twotinos have a resonance of 1:2 and are located near the very edge of the Kuiper Belt, occurring at 47.8 AU. Scattered KBOs are objects that have wandered too close to Neptune in the past, resulting in an irregular orbit. Some Scattered KBOs have orbits that stretch hundreds of AU away from the Sun at the most distant point in their orbit and then return even closer to the Sun than Neptune. Therefore, their orbits may intersect Neptune’s orbit, but this does not mean that they are likely to collide. Dwarf Planet locations in the Kuiper Belt. Courtesy of NASA/JHUAPL/SwRI. The IAU has officially designated five objects as dwarf planets: Pluto, Eris, Makemake, Haumea, and Ceres. This is only a small fraction of the hundreds of other probable candidates. But what is a dwarf planet? Must be round and massive enough so that its own gravity is the dominant force affecting it. The size of a dwarf planet depends on its composition: more rigid materials require a larger diameter and mass to become spherical. Must achieve hydrostatic equilibrium. This is where the outward pressure equals the inward force of gravity of a massive object such as a planet or star. Must be is in direct orbit around the sun. It cannot revolve around another celestial body like a moon or satellite does. When Pluto was “demoted” to dwarf planet, the topic was debatable because many did not understand the reason for change. Some were in this stage of denial while others discredited the ex-planet. Now that the dust has had time to settle, the question remains: Should Pluto still be taught in schools? Yes. Probably more than ever, as Pluto is our gateway to the Outer Solar System, which has only recently been discovered. Pluto is still an important part of our solar system, not just a fallen planet to forget about. In fact, other objects in the Kuiper Belt should be taught at the same time as it could increase our understanding of other astronomical objects and the origins of our solar system. The recently discovered KBO, 2014 MU69, is an excellent example of how the Kuiper Belt Objects are furthering our knowledge of the solar system. MU69 is a Cold Classical KBO, which means that it is believed to be relatively unchanged from its origin. Comparing any findings from these unchanged bodies to the more evolved parts of the solar system, such as the planets, tells the story of how the planets and solar system have changed over time. The New Horizons probe recently completed its flyby of Pluto and is now on course to fly past 2014 MU69 in 2019. This will be an exciting time for scientists to discover more about the origins of the solar system. It would be like having a snapshot in time to see what the objects in our solar system might have been like before the planets formed. Every new discovery from the Kuiper Belt is a contributing piece to the puzzle of understanding the evolution and nature of our solar system and beyond. It is important to communicate these new discoveries to students not only so that they are up to date on the topic but also to help them understand that science is fluid. Many students believe that there is a right and final answer when it comes to science class, but research is continuous and ever changing. It can be a tough concept to grasp but you have to approach science and astronomy with an open mind to see the different ways science can be interpreted. 1Chris Jones, Pluto Facts. WWW Document, (http://space-facts.com/pluto/). Date accessed: 5 April 2016. 2Nola Taylor Redd, How Was Pluto Formed?, WWW Document, (http://www.space.com/18561-how-was-pluto-formed.html). Date accessed: 29 March 2016. 3Fraser Cain, How Big Is Pluto?, WWW Document, (http://www.universetoday.com/39565/how-big-is-pluto/) Date accessed: 29 March 2016. 4Sandra May, What Is Pluto?, WWW Document, (http://www.nasa.gov/audience/forstudents/k-4/stories/nasa-knows/what-is-pluto-k4.html). Date accessed: 29 March 2016. 5Nola Taylor Redd, What is Pluto Made Of?, WWW Document, (http://www.space.com/18562-what-is-pluto-made-of.html). Date accessed: 28 March 2016. 6Editors of Encyclopædia Britannica, Percival Lowell, WWW Document, (http://www.britannica.com/editor/The-Editors-of-Encyclopdia-Britannica/4419). Date accessed: 28 March 2016. 7Charles Q. Choi, Dwarf Planet Pluto: Facts About the Icy Former Planet. WWW Document, (http://www.space.com/43-pluto-the-ninth-planet-that-was-a-dwarf.html). Date accessed: 28 March 2016. 8Bill Dunford and Katie McKissick, Kuiper Belt: Overview, WWW Document, (http://solarsystem.nasa.gov/planets/kbos). Date accessed: 28 March 2016. 9Bill Dunford and Katie McKissick, Eris: Overview, http://solarsystem.nasa.gov/planets/eris. Date accessed: 28 March 2016. 10Bill Dunford and Katie McKissick, Dwarf Planets: Overview, WWW Document, (http://solarsystem.nasa.gov/planets/dwarf). Date accessed: 28 March 2016. 11Matt Williams, What Is A Dwarf Planet?, WWW Document, (http://www.universetoday.com/72717/what-is-a-dwarf-planet/). Date accessed: 29 March 2016. 12NASA, WWW Document, (http://www.nasa.gov/audience/forstudents/k-4/stories/nasa-knows/what-is-pluto-k4.html). Date accessed: 29 March 2016. 13Astro-Tom, WWW Document, (http://www.astro-tom.com/getting_started/planet_classification.html). Date accessed: 29 March 2016. 14Jean-Luc Margot, What Makes A Planet?, WWW Document, (http://mel.ess.ucla.edu/jlm/epo/planet/planet.html) Date accessed: 29 March 2016.